Georgia’s Defence Minister Tina Khidasheli has stated at the Defence and Security Conference in Tbilisi that if the upcoming NATO Warsaw summit does not make it clear to Russia that Europe will not tolerate the appearance of a new “iron curtain”, the Kremlin will win. According to Khidasheli, clear, direct and strong messages need to be voiced towards Russia, adding that Georgia has high expectations for the Warsaw summit. ‘If is not made abundantly clear to Russia that Europe will not tolerate the appearance of a new “iron curtain”, that there are no more isolated spheres of influence, that Russia will not have any future veto rights, it will be our weakness and the Kremlin’s victory at the same time, and will lead the latter to further aggression,” Tina Khidasheli said. ‘From our point of view, the summit results will confirm once again that the NATO open-door policy represents an irreversible and real process in which the third party will never be involved as an obstacle. I believe there will be no more barriers between Georgia and NATO and the latter will boldly say that Georgia is ready for membership in the alliance,” she declared. In her previous statement, the Minister stressed that an Alliance refusal in Warsaw for a Membership Action Plan (MAP) would severely disappoint Georgia's population and curb enthusiasm (and increase scepticism) towards eventual membership. 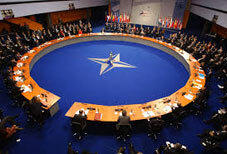 NATO representatives have stressed that NATO still enjoyed positive attitude towards Georgia.